One of the most common birth defects is hearing loss or deafness (congenital), which can affect as many as three of every 1,000 babies born. Inherited genetic defects play an important role in congenital hearing loss, contributing to about 60% of deafness occurring in infants. Although exact data is not available, it is likely that genetics plays an important role in hearing loss in the elderly. 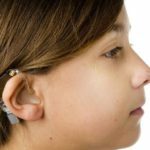 Inherited genetic defects are just one factor that can lead to hearing loss and deafness, both of which may occur at any stage of a person’s lifespan. Other factors may include: medical problems, environmental exposure, trauma, and medications. Non-syndromic hearing impairment accounts for the vast majority of inherited hearing loss, approximately 70%. Autosomal- recessive inheritance is responsible for about 80% of cases of non-syndromic hearing impairment, while autosomal-dominant genes cause 20%, less than two percent of cases are caused by X-linked and mitochondrial genetic malfunctions. Syndromic (sin-DRO-mik) means that the hearing impairment is associated with other clinical abnormalities. Among hereditary hearing impairments, 15 to 30% are syndromic. Over 400 syndromes are known to include hearing impairment and can be classified as: syndromes due to cyotgenetic or chromosomal anomalies, syndromes transmitted in classical monogenic or Mendelian inheritance, or syndromes due to multi-factorial influences, and finally, syndromes due to a combination of genetic and environmental factors.